Take the A528, Coton Hill road, through Albrighton in the direction of Ellesmere. At Harmer Hill take the B5476 in the direction of Wem. At the T junction with the High Street in the centre of Wem, turn left on the B5063, direction Ellesmere and Adams Sport Centre. Pass Hawkins Motors Ford Garage and turn right into Lowe Hill road, follow until T junction and turn right, after a short distance you will see a sign for New House Farm on your right. Leave Oswestry on A495 heading in direction of Whitchurch, at Welshampton take the B5063 to Wem. 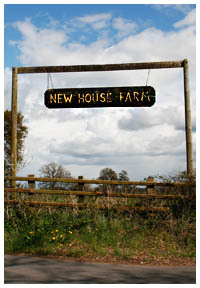 At the village of Horton turn left towards Edstaston and Whixall, though the village of Lowe and Highfields, before you reach a T junction look out for the sign for New House Farm on your right. At the roundabout junction with A41 and A525 south of Whitchurch on the bypass, take the B5476 Tilstock road in the direction of Wem, after 7.5 miles at the village of Edstaston, turn right for Loppington, in 200 yards at T junction turn right, then in just 300 yards turn left again following signs for Loppington (just before the sign marked “unsuitable for lorries”) a short distance on this road will be a sign for New House Farm on your left. From Tern Hill travel north on the A41 in the direction of Whitchurch, at the end of the short dual carriageway on entering the village of Sandford there is a narrow bridge and a sharp right bend at which point turn left onto the B5065 in the direction of Prees and Wem. In just 100 yards at the cross roads turn left, continue on the B5065. In just 1 mile turn right towards Wem, staying on B5065. In ½ mile at T junction with the A49, direction Whitchurch and take the second turning left onto Aldersey Lane. Follow until you reach the village of Quina Brook, at T junction with B5476, turn left then in just 1 mile, at village of Edstaston turn right for Loppington, in 200 yards at T junction turn right, then in just 300 yards turn left again following signs for Loppington (just before the sign marked “unsuitable for lorries”) a short distance on this road will be a sign for New House Farm on your left. Take the B5063 through Longdon upon tern in the direction of High Ercall and Shawbury. In Shawbury turn left on the A53 and turn right at the traffic lights to rejoin the B5063 passed RAF Shawbury. Continue on the B5063 until you reach a roundabout, go straight ahead onto B5046 direction Whitchurch. At the T junction with the High Street in the centre of Wem, turn left on the B5063, direction Ellesmere and Adams Sport Centre. Pass Hawkins Motors Ford Garage and turn right into Lowe Hill road, follow until T junction and turn right, after a short distance you will see a sign for New House Farm on your right.